….painting selected by Heeley Art Club for “Sheffield in the Frame” Exhibition, Winter Gardens, 8 – 17th October 2011. (“Cal” the Whippet previously featured in the Coffee Revolution painting). 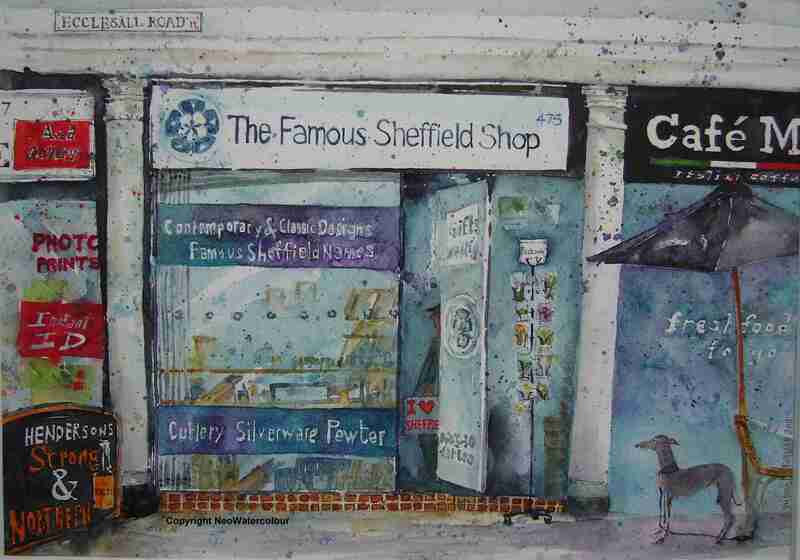 This entry was posted in Sheffield - watercolours and tagged Don Alexander, Ecclesall Road, Famous Sheffield Shop, Heeley Art Club, Marco's Cafe, Sheffield Photographic Centre, Winter Gardens Sheffield. Bookmark the permalink. 1 Response to The Famous Sheffield Shop……………………….